Description: One among the best blends of green tea to arrive from Darjeeling. 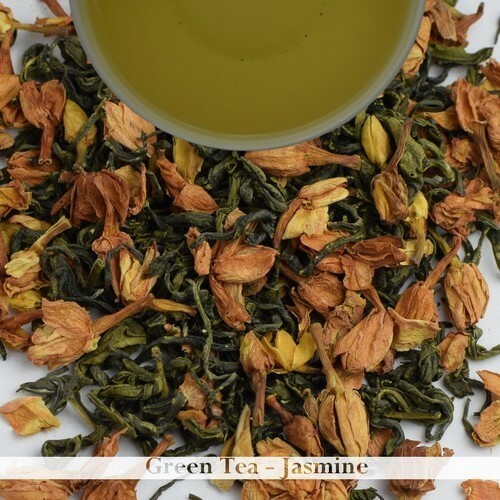 This Jasmine green tea is blended with premium quality green tea for that added benefit along with sterilized petals of Jasmine making it one of the finest Jasmine tea found elsewhere. The dry leaves oozes a mix of Jasmine fragrance with that of ripe peach, dried apricots and 'Chiku' (A tropical fruit of India with sweet taste). Liquor: The tea made from this Jasmine blend was highly aromatic with the tea liquor having hues something in between light greenish to faint yellow. The just brewed tea had a strong Jasmine flavor along with ripe peach like aromas but the tea tasted better as it cooled with the Jasmine flavor settling down a bit adding a nice sweet aftertaste with floral notes which was noted hours after the sip. The tea was not astringent as other Jasmine teas even after we brewed for 5 minutes. It is advisable to enjoy this tea as it cools. Brewing Suggestion: It is advisable to brew 2gm of the tea for a cup of 200ml water brewed for 4 to 5 minutes at 70C to 80 C (158F to 176F).